Hamish MacCunn was born in Greenock on the 22 March 1868. He was the second son of wealthy shipbuilder and merchant, James MacCunn. From a young age he showed musical promise, composing melodies at 5 years old, and at 12 he started an oratorio. He was educated locally at Greenock Academy, then Kilblain Academy, then Graham’s Collegiate School before winning a scholarship to the new Royal College of Music under Charles Villiers Stanford and Hubert Parry. By 1887 he had produced his first overture Cior Mhor and it was performed to great success at the Crystal Palace, London in the same year. In 1889 he composed probably his best known work Land of the Mountain and the Flood. Like other Scottish composers of the Victorian age, his work was recognisably Scottish, indeed MacCunn’s works were probably the most influenced by Scotland, to the extent that he was almost regarded as Scotland’s national composer of the time. From 1888 to 1894 he became a Professor at the Royal College of Music. 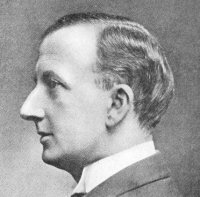 It is said that his hectic schedule of composing, conducting and teaching contributed to his early death at the 2nd August 1916 aged only 48. His manuscripts and published works were donated to Glasgow University by his widow in 1951. You are currently browsing the archives for the Hamish MacCunn category.